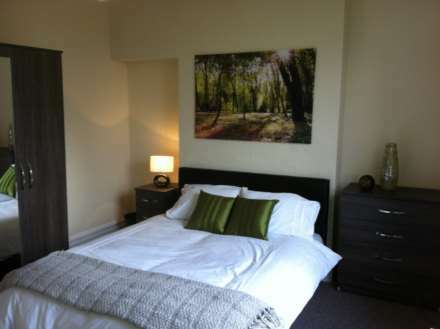 Just redecorated this double room is perfectly located if you are a young professional working close to the city centre. It`s just a five minute walk into town and with Azda on your doorstep open from 7am till 10pm you can just pop over whenever you need supplies. This contemporary three-story townhouse is shared with four other friendly young professionals and with a great sized kitchen, through lounge, you can cook, socialize and game. The large walled rear garden is a real suntrap in the summer. This gorgeous bedroom comes with a double bed and really comfortable orthopaedic mattress ensuring a great nights sleep along with plenty of storage space for your belongings. Need parking? There`s a secure parking space in the rear garden or plenty on the no through road at the front. If you have a bike then the large garden shed will keep it secure and dry. A separate utility room with washing machine, tumble dryer and washing line outside means your laundry days are super easy. These great facilities include two good sized bathrooms. There is a special offer of first week rent free so be quick to book a viewing. All your bills are included, along with the highest speed wifi, council tax and a cleaner that comes around every fortnight to ensure the shared areas are kept clean. For your peace of mind references are always taken and to move in it`s just £200 security deposit, £149 administration fee and your first months` rent in advance.